Adult Pirate Party Cruises are for ages 21 and up (photo ID required at boarding). Party pirates are invited to Get Their Pirate On aboard Queen Anne’s Revenge. A raucous time will be had by all as we party our way around the Lake Washington Ship Canal and Lake Union. Our cruises are interactive and our merry pirates will have you up on your feet for the duration of the cruise. Defend the honor of Queen Anne’s Revenge as we fire the ship’s water cannons (weather permitting). Enjoy games and contests on the cruise. Nightly prizes for the Best-Dressed Pirate. 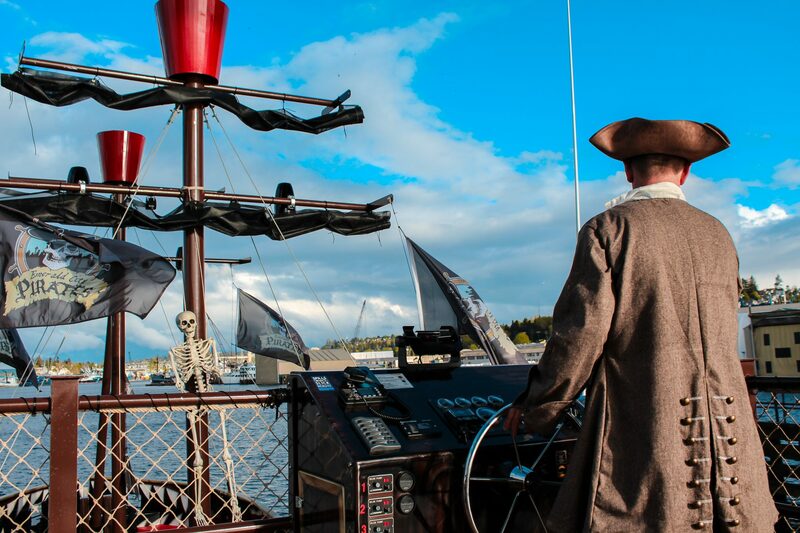 Party pirates are encouraged to arrive at Lake Union Park (860 Terry Ave N) in the South Lake Union neighborhood of Seattle at least 30 minutes prior to boarding time. Upon boarding, all party pirates receive an Emerald City Pirates vest to wear for the duration of the trip with a pirate name tag (weather permitting). Head to the ship’s store to purchase pirate swag not pre-ordered as well as snacks and beverages, including beer, cider and seltzer. Outside food is not allowed on Adult Pirate Party Cruises. Boarding activities last approximately 15 minutes. The cruise lasts approximately 1:15 minutes, with up to 15 minutes of disembarkation time, for a total experience of up to 1 hour 45 minutes. $29 per adult for an amazing pirate packed cruise! What are you waiting for? Join us, matey! Group Rates Available for groups of 15 people or more. Must call 206-639-8689 to book.